The cupcake gods have smiled on me today. I was beginning to get worried. While last week’s cupcakes weren’t a total bust (like the week before) they still were not what I’d been hoping for. But this week’s cupcakes…oh my. Just what I was looking for. These are more of an adult cupcake...I think. Matcha is made from shade-grown tea leaves also used to make gyokuro unlike other forms of powdered tea. The preparation of matcha starts several weeks before harvest, when the tea bushes are covered to prevent direct sunlight. This slows down growth, turns the leaves a darker shade of green and causes the production of amino acids that make the resulting tea sweeter. Only the finest tea buds are handpicked. After harvesting, if the leaves are rolled out before drying as usual, the result will be gyokuro (jewel dew) tea. However, if the leaves are laid out flat to dry, they will crumble somewhat and become known as tencha. Tencha can then be de-veined, de-stemmed, and stone ground to the fine, bright green, talc-like powder known as matcha. It can take up to one hour to grind 30 grams of matcha. Note that only ground tencha qualifies as matcha, and other powdered teas are known as konacha ("powder tea"). The flavor of matcha is dominated by its amino acids. The highest grades of matcha have more intense sweetness and deeper flavor than the standard or coarser grades of tea harvested later in the year. For me, what this tea is about is an earthiness. It has a quality that is difficult to explain, but I really like it. I am a big fan of green tea ice cream-just ask anyone at Eastern Palace! When it comes time for dessert, they ask everyone else at the table what they’re having and just bring my green tea ice cream! It’s pretty funny! Now about this recipe…WOW. There is simply nothing to not like here, folks. The cake is light and moist and the prettiest green and just delicious. It has a hint of that wonderful earthiness I was talking about. I had to slap my own hands to make myself stop eating these before I could get them iced! And then when the icing was added on…HOLY SMOKE BATMAN!!! I really hope you’ll give these a try. The matcha is pretty readily available because of its increased popularity, and it is becoming more mainstreamed in pastries here in the states. 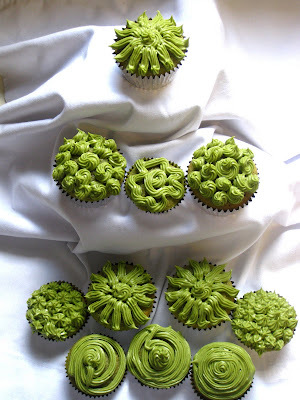 Take a walk on the wild side and bake something green! Actually, the kids might dig them afterall!!! 1. Preheat the oven to 350 degrees F (325 degrees F with convection). Place muffin liners in a mini muffin tin and a regular muffin tin. 2. In a medium-sized bowl, sift together all purpose flour, cake flour, matcha powder, baking soda, and salt. Set aside. 3. In a large bowl, beat together sugar, oil, eggs, and vanilla. 4. Alternating between dry mix and sour cream, stir into the wet mixture until just combined. 5. Fill mini muffin cups so that the tin looks about 2/3 full. 6. Bake mini muffins for 10 minutes, or until toothpick comes out clean. Remove and let it cool for 10 minutes before removing to a cooling rack. 7. While mini cupcakes bake, fill regular sized tin a little more than 2/3 full. Bake for 15 minutes, or until toothpick comes out clean. Cool for 10 minutes before removing to a cooling rack. Cool cupcakes completely before frosting. 8. 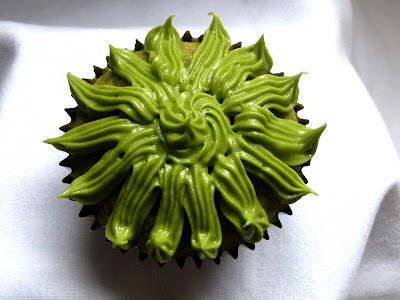 To make frosting, sift together confectioner’s sugar and matcha powder. Set aside. Using a heavy duty mixer with the paddle attachment, beat together cream cheese, butter, and vanilla on medium speed for 5 minutes. Reduce the speed to low and add sugar/matcha gradually. Once all of the sugar/matcha is mixed in, increase speed to medium and beat for 5 minutes more. Frost with piping bag. 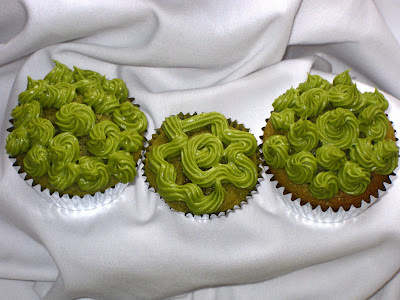 The designs looks really pretty :) i'm a green tea fan so i'll be sure to try this recipe!